We’ve been down this xenophobic path before. And when Donald Trump infamously described the Charlottesville protestors as being among the “many fine people on both sides,” you know just how far backward the country was going. But then this week’s elections happened. The American people in Virginia and around the country replaced the chanters and their sentiments with a more inclusive sense of politics. Nationally, the talk is about Virginia Governor-elect Ralph Northam’s much larger than anticipated win against his Republican challenger, Ed Gillespie, the largest margin in a generation. Trump said Gillespie wasn’t standing with him, and that’s why the Republicans lost. But that’s not what I saw in my short time in the Northern Virginia area leading up to election day. Gillespie may not have been carrying a tiki torch and chanting, but he was as close to Trump as a sane Republican would want to be. All throughout Tuesday, the results were clearly a Trumpudiation. It was also the restoration of a sense of diversity politics. The way the GOP was heading before Trump’s hostile takeover. You just can’t alienate ethnic voters with exclusionary hate rhetoric and white guys with tiki torches. Democrat Phil Murphy, a first-time candidate, won in his bid to replace Trumpy Governor Chris Christie. Murphy easily trounced Republican Lt. Gov. Kim Guadagno. More notable was the rise of ethnic candidates down ticket. 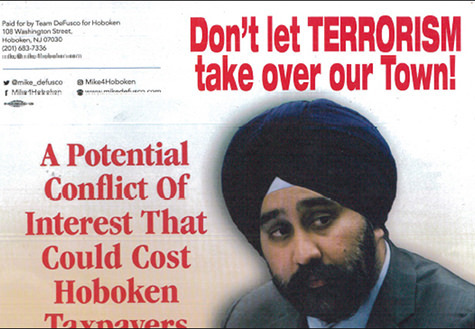 Vin Gopal beat a GOP incumbent in New Jersey State Senate #11, and Ravi Bhalla, the Sikh man who was called a terrorist because of his turban, won the Hoboken mayoral race. 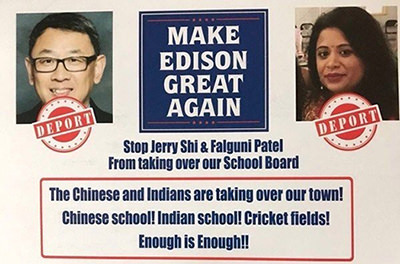 Jerry Shi and Falguni Patel, two school board candidates in Edison, NJ who were targeted in a racist “Make Edison Great Again” campaign mailer, both won election. In Virginia, it was no different. Diversity triumphed. The Washington Post noted that of the 15 seats Democrats flipped, all were held by men and 11 were won by women. Some of them even made history. There was the first openly transgender person to win elective office in Virginia; the first Latinas elected to the General Assembly; the first open lesbian to the House of Delegates. 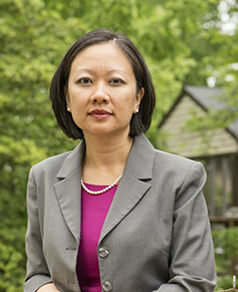 And for Asian Americans, there was Kathy Tran, of Vietnamese descent, the first Asian American woman elected to the General Assembly. Other winners included incumbent Mark Keam, a Korean immigrant who has served as a state delegate from Northern Virginia; and then there was Kelly Convirs-Fowler. The latter may be more interesting to Asian Americans because Convirs-Fowler unseated an incumbent Filipino American, Ron Villanueva–a Republican–in a very Filipino district around Virginia Beach in the Hampton Roads section of the state. Convirs-Fowler, a Democrat, clearly rode the anti-Trump wave. But she also knew enough to claim she was at least a quarter Filipino and used it in the campaign. The person I talked to was a Democrat who this week was happy to vote for the Republican Filipino. While race has been used by Trump to divide the electorate, race can also be used as a unifying factor. In other words, race does on occasion have the power to trump politics. For example, when one sees an Asian face, or in this case a Filipino face, one can understand a tendency to vote for the person who looks like you. It happens. But even as I write this, I can think of Asian Americans on the opposite end of the spectrum. I can’t stand them and wouldn’t vote for them. So faulty premise, right? Whites don’t just vote for whites, blacks for blacks, etc. And in Virginia Beach, a conservative Filipino enclave, what is a Filipino Democrat to do? Though the numbers may seem overwhelming, you can’t always assume an Asian American or a Filipino American is a Democrat. In fact, most Asian American surveys point out how conservative Filipinos are. And yet, does it matter if race can get beyond party politics and build a sense of partisanship based on community? That was good enough for some Democrats I know in the minority in Virginia Beach to back Villanueva. But Villanueva too had some problems in this campaign with stories tying him to a corrupt defense contractor. And then there was the overall Trumpudiation he had to overcome. It’s left my friend wondering where this all leaves the Filipinos in Virginia. Don’t get me wrong. The Trumpudiation, in general, I believe, is ultimately a good thing for Asian America and the country in general. But it must be noted, not everyone downstate in Virginia is cheering. There was at least one Asian American casualty–Ron Villanueva. He paused and then delivered the political punchline. 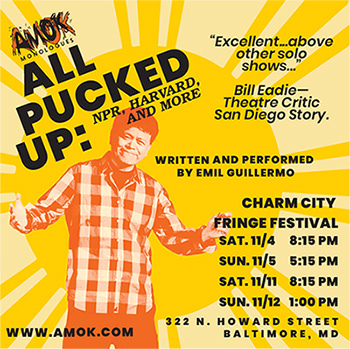 One more weekend of “Amok Mo nologues: NPR, Harvard and more” at the Charm City Fringe Festival in Baltimore. Get your tickets here. And listen to our podcast, “Emil Amok’s Takeout,” on iTunes and Stitcher.